Just took this out of the kiln this morning--still naked clay--no glaze yet. This baby is big. Fifteen inches tall; just under the lid on my shorty kiln. Originally it had feet, but I had to take them off. This is a new spout too. A bit more difficult to make, but I like it a lot. It's also hand formed, since I don't have a wheel here. Took much longer to make than a thrown one. I worried that the handle might not make it, but it came through okay. Several years ago, I cracked the code on how to make and dry these kinds of handles. It's a secret not for sharing. It took a ton of blood, sweat and lots of smashed pots to get there. The rest of the kiln contained lots of test tiles of terra cotta, B3 Brown and Hagi Porcelain. I made a tiny house of terra cotta, a small tumbler of the B3 Brown and a free-form vase of Hagi Porcelain. The Hagi cracked on one end, but I'm going to test glaze it anyway. Very thin walls and a whole new handbuilt form for me and a radical departure from my previous work. The Terra cotta has a nice, interesting hand, but a bit sandy for me; the B3 Brown is lovely. Very responsive. I like it a lot. The Hagi is cranky, a bit short and completely different than the porcelain I've been using. But, oooh, what beauty when it is fired. 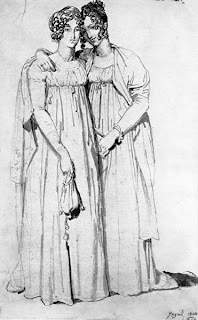 Just a quick note that I will be blogging again in about a week--I'm enjoying the luxury of a visit from my sister. It's wonderful to spend time with someone who you shared a childhood with and know so very completely. 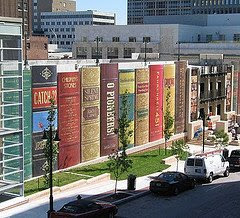 Recently, the UK Guardian newspaper published a list of "1000 Novels Everyone Must Read." (www.guardian.co.uk/books/2009/jan/23/bestbooks-fiction). It's interesting to see what they suggest. The list is broken down in categories: Comedy, Crime, Family and Self, Love, Science Fiction and Fantasy, State of the Nation, War and Travel. Each category is varied in the number of books selected. Now granted, this is a heavily weighted English list, although American writers are also included. (I was happy to see Eric Ambler, Falkner, Updike, Hemingway etc. on the list.) And the categories are not broken down quite like I would have done it. For instance, Kim by Kipling is listed as a crime book. And Gentlemen Prefer Blonds is listed as Love instead of Comedy. And War and Travel could have been separated. Crime and Mystery are two different categories to my mind as well as SciFi and Fantasy. 2. The percentage of books I have chosen to read in each category. 3. What different kinds of reading and new titles/authors I might look for when I go to the library, order new books, and download MP3 files from public domain sources like Librivox. I do read a lot of books that are non-fiction also, usually choosing those above novels. Generally, I want to learn new things in order to add to general knowledge. When I was in high school/college, I read everything I could get my hands on that would be put under the category of Self-Sufficiency and life skills. I wanted to know as much as I could about making things; be able to walk into the woods and 'read' the vegetation like a book. I think I bought every Foxfire and Euell Gibbons book there was. I was also big on medical books, First Aid and Emergency-type information. This led to serving some years on a volunteer emergency rescue and ambulance team plus good information when my children were small and we were living in other countries. I actually diagnosed my son's scarlet fever and was able to get him treatment quickly when we lived in the Middle East. Frustrated doctor, me. 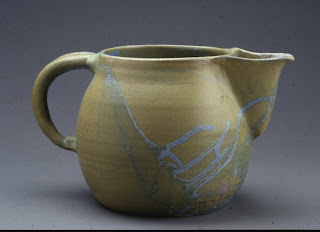 This is an old pitcher I threw very early in my clay-making. There are lots of flaws, but I've kept it around because I just like it. It is a large pitcher--holds about a half gallon of liquid, but it will never be used. It's too heavy. The bottom is thick. The walls are thicker than I would make today. And I'd use a different type of clay. The handle, although strong enough, doesn't have a flowing curve. And the top and bottom of the handle seem blunt. I added clay to both ends when I attached it to the body of the pot--I've learned better since then. I do like the spout. It pours without a drop. You probably can't see it in the photos, but there is an ice dam at the very top. 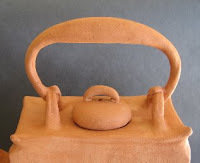 The spout is hand built, nice and deep, fits the body of the vessel and balances the power of the handle. 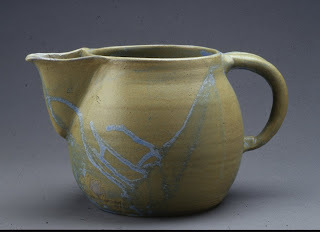 The whole relationship between the body, handle and spout "works". But the best thing is, I love the glaze. It was a special one; a spin-off from another rutile glaze that I had requested from my clay supplier. 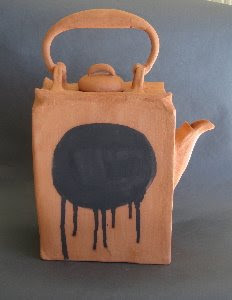 He had come up with a weathered bronze that worked well with my square teapots and was experimenting with a variation of the glaze. The lines are the result of dipping the pot in spout-first, then rotating the pot when I glazed the back of it. The thicker drips were rolled around the pot and surprised me when the drips fired this lovely blue. It's good to keep something around to remind yourself where you've been. One day, I'll make another and improve on the flaws. The body walls will be thinner. The handle will 'grow' from the walls of the pot. The roundness of both will be exaggerated. The spout will keep the dip between the ice dam and the tip. The bottom of the spout will be in line with the bottom of the handle. Or maybe I will use this form as a springboard to repeat but elongate it into an oval pitcher. I doubt I can duplicate that glaze, though.